How to make cream? How to make ice cream? How to make creme fraiche? How to make Baked Alaska? How to make an ice cream cake? 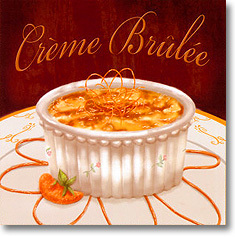 Crème brulée (French) was in fact originally an English recipe. Meaning Burnt Cream from the French it was originally invented (or burnt) at Trinity College, Cambridge. The translation and the definition of "creme brulee", really does mean "burning the cream." If you keep hens this is a great way to use those extra eggs as well. If you can you should start the recipe the day before so that the crème brulée custard will be firmly chilled. Heat the cream in the pan until it reaches boiling point. During this time you can blend the egg yolks, corn flour, caster sugar and vanilla essence in a separate bowl. When the cream has boiled pour it gently into the mixture in the bowl and stir continuously. Return the mixture to the pan and reheat gently, still stirring occasionally to stop it sticking and allow it to thicken. This quite a quick process and you could use a cream pan but really any pan with a high side will be suitable. Pour the cooked mixture into ramekins, cover with cling film and chill in the fridge. That's pretty much it until you sprinkle sugar over the top and burn before serving. If the crème pudding mix goes lumpy when heated, a good tip is that you can take it off the heat and beat it vigorously. it will become smooth again as it cools. It is best to use ramekins for the dishes. They are low and quite wide making it easy to pour the custard and heat the top. If you ever buy crème brulee in the shops they sometimes come in glass ramekins and these are reusable and ideal for the job. Divide the mixture into the dishes cover with cling film and put in the fridge for 8 – 24 hours this will get the puddings texture firmly chilled. The perfect chef uses a blow torch or high density grill to caramelise the sugar. This gives the top of the pudding a hard sweet surface. I don’t have a crème brulee torch for caramelising the sugar as it seems a bit extreme for just making a pudding but I probably will get one at some point in the future. I use an ordinary cooker grill set high and watch them carefully to get them right. You have to keep an eye on them during the grilling as sugar catches fire, burns badly and really rather spoils a nice warm crème brulée. 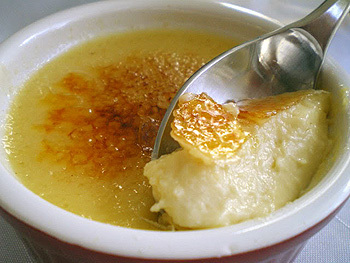 Another method for a homemade crème brulee topping is to make the caramel about an hour before serving. Place the granulated sugar in a heavy pan and heat it very slowly. This will make the caramel it should melt completely. If it doesn’t don’t stir the mixture just shake the pan or gently or tilt it. Lastly pour the caramel over the brúlée and allow it to cool and harden. They are ready to eat and make ideal desserts for any menu. Cracking the caramel with a spoon before eating the dish is part of the unique crème brulee enjoyment.